If you’ve been reading my blog for a few years, you may remember that I participated in a monthly blogging group called the Secret Recipe Club. The purpose of the club was bloggers were assigned another blogger each month and we’d choose a recipe from the blog to make and share on a designated day. Sadly the group ended a few years back but today we’re back for a reunion. How cool is that? I love reunions. And reboots. I can’t even tell you how thrilled I am about the shows I watched as a kid and teenager coming back on television! But anyway, for the reunion, I was assigned to An Affair From The Heart which is written by Michaela. I’m pretty familiar with her blog and have quite a few of her recipes pinned to make. Michaela is a SAHM who loves cooking, baking and entertaining and bases her recipes around that. If you’re in need of appetizer recipes, I can promise you that you’ll find something on her blog that you’ll love. Well, you can find something you’ll love under every category, but I tend to gravitate towards her appetizers. Which is why I pushed out of my comfort zone and checked out her desserts for this blogging event. 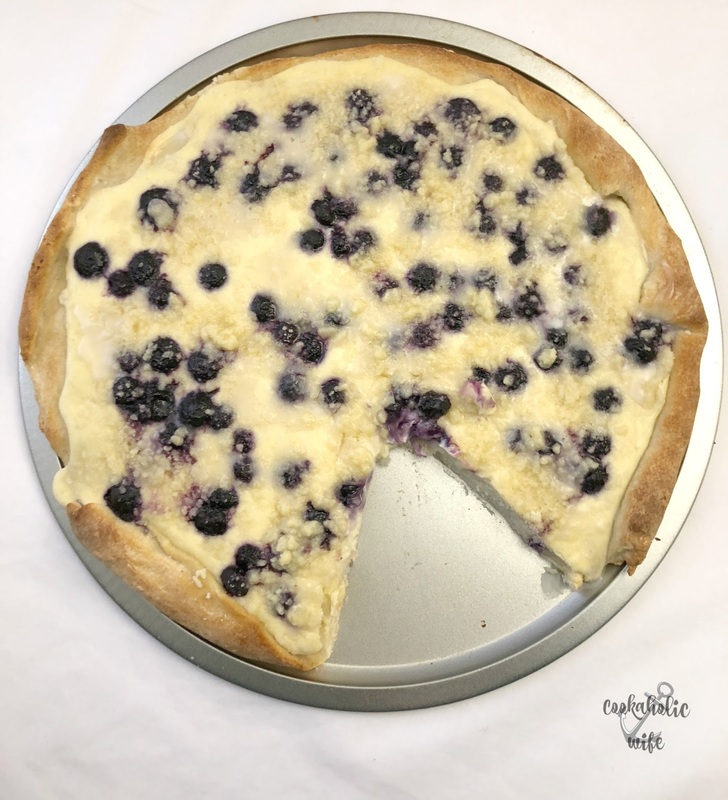 An easy dessert pizza made using cream cheese, streusel topping, and blueberries. Preheat the oven to 425 degrees. Line a large baking sheet with foil and set aside. Roll out the pizza crust onto a round pizza pan, creating a lip of dough for the crust. This will hold the cheesecake mixture in. Poke all over the crust with a fork to prevent it from baking up too much. Bake for 6-7 minutes, then remove from the oven and let cool. Meanwhile, prepare the filling ingredients by coming the whipped cream cheese, sour cream, sugar and vanilla in a bowl and beating with a mixer until smooth. Add in the egg and mix until combined. Prepare the streusel by combining ingredients in a bowl and using a pastry cutter, two forks or your fingers, mix until the mixture resembles coarse crumbs. Set aside. 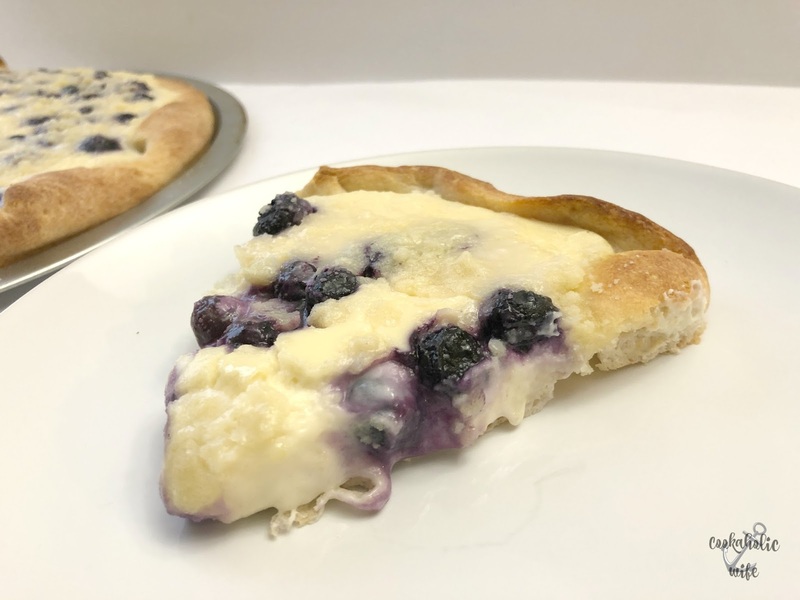 Once the pizza dough has baked, spread the cream cheese filling mixture on top to each edge. 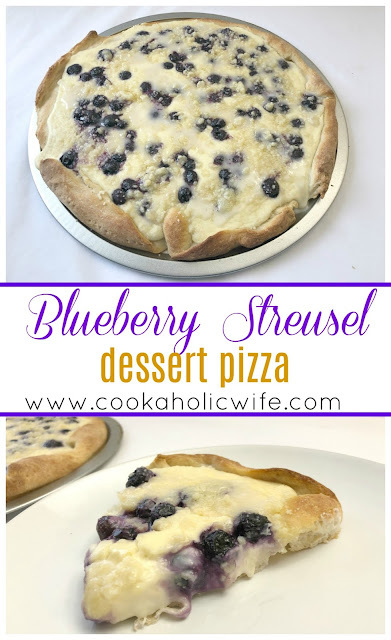 Sprinkle the fresh blueberries on top and then spread the streusel on top of that. Bake for 12-15 minutes or until the mixture is set and the edges are lightly golden brown. While it’s baking, combine the powdered sugar and milk together in a bowl and whisk until combined. Add more powdered sugar if the glaze is too thin, add more milk if it is too thick. 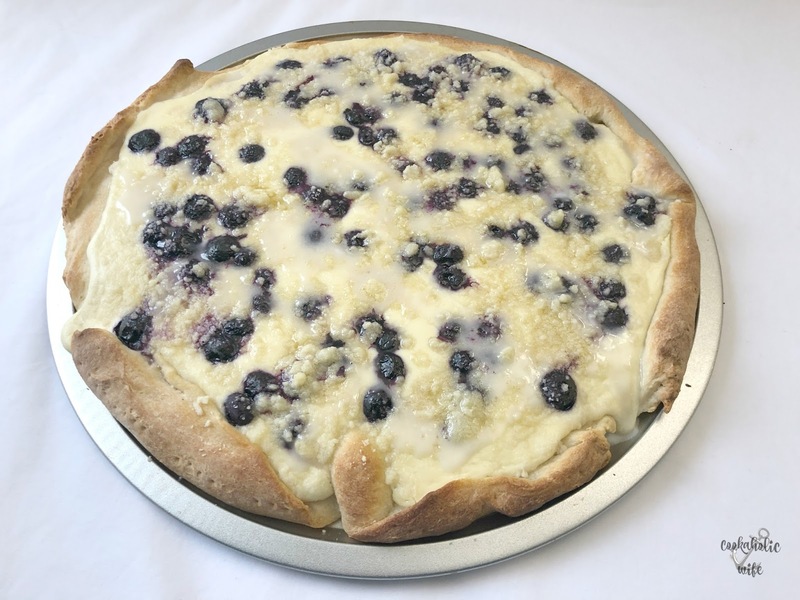 Drizzle the glaze on top of the pizza and allow to cool slightly before slicing into wedges and serving. I haven’t made a dessert pizza in ages so when I saw this recipe, it really stuck out to me. I had recently picked up some fresh blueberries without a plan to use them up so I found this at the perfect time. The recipe comes together really quickly. The filling and streusel can be made while the dough is on it’s first bake and then it’s just patiently waiting for it to come out of the oven. 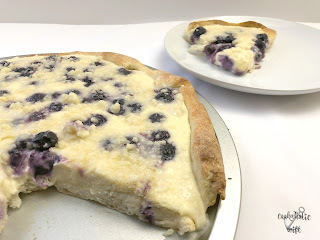 I wasn’t sure how this recipe would work using a standard pizza crust and the idea of putting it on top of a cinnamon roll crust crossed my mind, but I’m glad I made the recipe as is. The sweetness from the filling, glaze and blueberries is enough for the dish that the non-sweet crust actually pairs perfectly with it. I saw streusel so I came running! There can never be too much streusel, imho. Such a fun pizza! My kids would absolutely love this! This sounds so delicious! What a great choice! This looks sooo yummy!! Great pick for SRC! 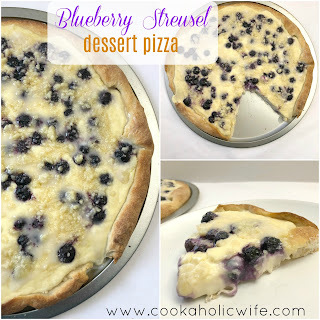 It's been a long time since I've had a dessert pizza and I definitely want this! Great choice Nichole. I am drooling here.